Chinese activist Chen Guangcheng talks with colleagues before speaking at the National Press Club in Washington, Wednesday, Oct. 2, 2013. BEIJING - The mother and brother of a prominent blind Chinese activist have received permission from the government to visit him in United States, a rare sign of tolerance on the part of authorities amid a broader crackdown on dissents. Although, his family won't believe the government's promise is real until they board a plane to the United States. "We are not sure yet if we will be allowed to fly, but we are set to go,” said Chen Guangfu, the elder brother of Chen Guangcheng, who escaped from house arrest in April 2012 and fled to the U.S. embassy in Beijing some 500 miles away. The incident prompted a diplomatic crisis between China and the United States. After weeks of tense negotiation, American and Chinese officials reached an agreement that allowed Chen, his wife and child to gain asylum in the United States. “Our mother has not seen Guangcheng for almost 19 months, and she is very happy that she can see him again,” the 56-year-old added. 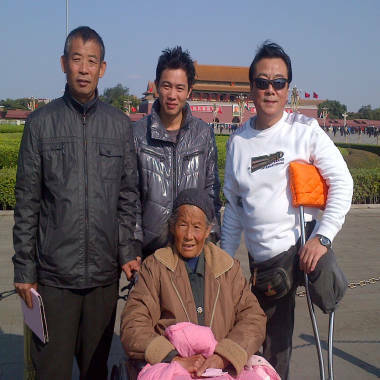 The activists' mother, Wang Jinxiang, is 79 and moves around in a wheelchair. Members of Chen Guangcheng's family and supporters touring Tiananmen Square before departing Beijing, China, on Oct. 24, 2013. The pair plan to fly to the United States on Wednesday. Blind since childhood and a self-taught lawyer, Chen was a thorn in the side of local authorities for his opposition to forced abortion and sterilization abuses under China’s one-child policy. He spent more than four years in jail and was later placed under house arrest, becoming a rallying symbol of China’s human rights movement. After Chen’s departure, the roadblocks and checkpoints around his home were lifted, but his family remaining in China complained of continuing harassment. Chen cited the imprisonment of his nephew, who was charged with causing an injury during a dispute with local guards, as evidence of political persecution. The Chens’ visit to the U.S. comes amid reports of a widening crackdown on political dissent in China, as outlined in the latest report by the U.S. Congressional-Executive Commission on China. Chinese authorities have reportedly rounded up scores of political activists and outspoken bloggers, ahead of a crucial gathering of Communist Party leaders that convenes this weekend. 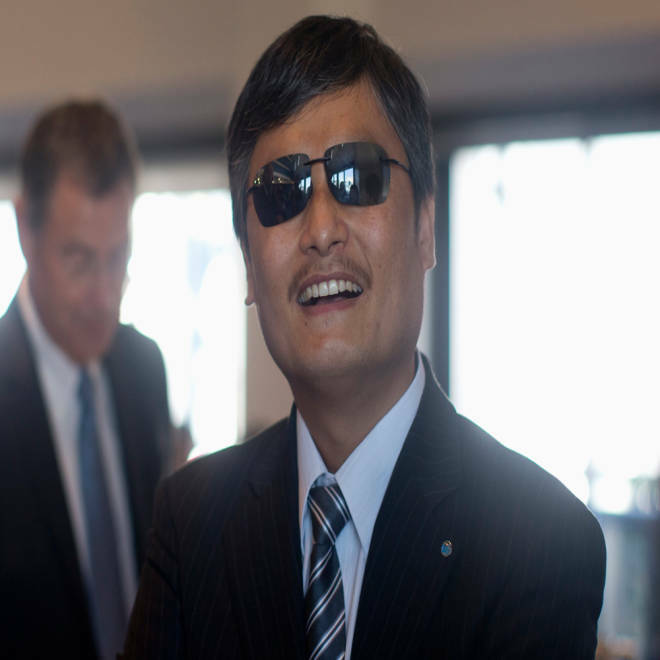 Blind social activist Chen Guangcheng is starting a new life of freedom in the U.S. NBC's Michelle Franzen reports. During a recent Beijing visit, the Chens and their supporters visited the home of former top Communist Party leader Zhao Ziyang who was pushed out of power in 1989 for his sympathies with the Tiananmen Square pro-democracy movement. They offered flowers for Zhao, who passed away in 2005. The Chens’ family reunion in United States, if it takes place, will likely draw attention once again to China’s controversial human rights record. The family's anxiety about whether they will be able to travel or not is based on past experience. In 2007 Chen Guangcheng’s wife was seized at the Beijing airport and forced back to her village just as she was about to board a flight to collect an international human rights award for Chen while he was still in prison. Chen Guangcheng, his wife and their two children now reside in New York. After a one-year fellowship at New York University, Chen is currently sponsored by the Catholic University of America, the Witherspoon Institute, and the Lantos Foundation for Human Rights and Justice. Researcher Chenyue Zhu contributed to this report.